$400 – $650 Instant Savings. Expires May 23, 2019. * All prices reflect savings. Once a global superpower and now rejuvenated as one of the trendiest destinations in Europe, Portugal will impress with its eclectic repertoire of vibrant cities and historic towns, stunning beaches and old-world countryside, and some of the best cuisine on the continent. You’ll start your journey in Porto, along Portugal’s river of gold, sampling the region’s famous Port wine from the centuries old cellars in the city. As you travel south, you’ll discover Aveiro, Coimbra and Fatima, towns that color the country’s cultural offerings. Explore medieval Portugal within the walled city of Obidos amongst its cobbled streets and whitewashed houses before you glide smoothly into three nights in Lisbon. The country’s capital is bound to enchant, with its lovingly restored yellow trams that ply the hills and the sound of melancholic and introspective Fado music joining you over a meal of freshly baked bread, olives and cheese with chargrilled fish and smoked meat. Portugal is at the confluence of Europe and Africa, with a history of influence from the Celts, Romans, Visigoths, Moors and Christians. This is evident in the windswept medieval hillside castles and the superbly simple but surprisingly sophisticated cuisine, or in the ruins at Conimbriga and the five centuries old university at Coimbra, or in the well-worn and friendly people that hang at corner bakeries in Lisbon. Portugal is also one of the best values in Europe right now, where sights, food and accommodation are surprisingly affordable and English is widely spoken. 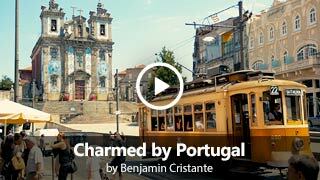 The travel world has finally adjusted its focus on Portugal and Friendly Planet is excited to help you discover why. Instant Savings: Get $400 – $650 off if you book by May 23, 2019! Accommodations: 3 nights Dom Henrique Hotel, Porto or similar. Included meals: Dinner. Upon arrival in Porto, following customs and immigration formalities, meet your guide and have a panoramic drive en route to your hotel. Full Day Itinerary: Upon arrival and after clearing customs formalities, meet your guide and transfer to your hotel. En route, enjoy a panoramic tour. See the Clerigos Tower, the University of Porto, the Lello Bookshop, and the Carmo Church. Stop for some free time where you can visit local pastry shops for coffee and a light breakfast. Transfer to your hotel in the center of the city and have the afternoon at leisure. This evening, get to know your fellow travelers during a welcome dinner with wine. Full Day Itinerary: After breakfast, enjoy a full day of sightseeing in Porto. Visit the historical center starting with the Cathedral, built in the 13th century. Continue to the Sao Bento Train Station, the interior of which is covered by historic tile paintings. Proceed on foot towards the river through Flores Street, passing the Misericordia Church from the 16th century. Arrive in the Ribeira, the most typical neighborhood of Porto along the Douro River, where fishermen and merchants used to live. Choose from a great variety of restaurants for a quick, independent lunch. This afternoon, cross the historic Dom Luis I Bridge, built in the 19th century. Visit one of the famous Port wine cellars and learn more about this amazing wine during a tasting. Afterward, enjoy the beautiful views of the city while you cruise along the Douro River. The balance of the evening is yours to explore the city. Full Day Itinerary: After breakfast, enjoy a full day of leisure to explore all this city has to offer. Alternatively, you can join an optional cooking class. Optional Excursion: Cooking Class, $75 pp. This afternoon, join an optional cooking class! A fun and tasty experience in the center of Porto where you will learn how to prepare Portuguese delicacies. Afterward, enjoy your culinary creations with your fellow chefs. Accommodations: 2 nights Vila Gale, Coimbra or similar. Included meals: Breakfast. Full Day Itinerary: This morning, depart Porto for the historic city of Coimbra. En route, stop in Aveiro, known as the Venice of Portugal due to its canals, for a panoramic tour. Begin on the outskirts of the city at Costa Nova Beach, famous for its colorful striped houses. Then, see the train station covered with tile paintings, the Cathedral, and the Jeronimo Pereira Campos factory, once a ceramic factory that is now a congress center. Arrive in the city center and board your Moliceiros (traditional boats) and cruise through the canals of the quaint, traditional town. Then, participate in a pastry workshop where you will learn about, and create Ovos Moles, a typical Portuguese pastry. Continue to Coimbra and check-in to your hotel. Full Day Itinerary: After breakfast, visit Conimbriga, one of Europe's great Roman archaeological finds and among the best preserved Roman ruins in Portugal. Continue to Coimbra to visit the University. Here you will see the Academic Prison, the only existing medieval prison in Portugal; the beautiful Joanina Library, this Baroque library houses collections dating from the 16th century; San Miguel Chapel, the Armory, and the Great Hall of Acts, also known as the Hall of Capelos, the main room of the University of Coimbra, and the place where the most important ceremonies of academic life take place. Walk through the medieval old town of the city, enjoy lunch on your own or return by coach to the hotel. The remainder of the day is at leisure. Accommodations: 1 night Hotel SANA Silver Coast, Caldas da Rainha or similar. Included meals: Breakfast & dinner. Full Day Itinerary: This morning, depart Coimbra and head south to Fatima, one of the main Marian Shrines throughout the world, and the religious epicenter of Portugal. Here, you will have the opportunity to visit the Sanctuary and the Basilicas. Stop at the Olive Oil Museum, which tells the story of olive oil production in the region, and displays the equipment used in the past. At the end of the visit, enjoy a tasting. After an independent lunch, visit the friendly fishing town of Nazare, whose inhabitants have retained their longstanding and colorful fishing traditions. You may have the opportunity to see the typical fishing boats - colorful and narrow, which resemble those used by the first fishermen of this region, the Phoenicians. Or perhaps you will witness the nazarenas (local women) wearing the traditional "seven skirts," using an ancient method to dry fish along the seawall. Continue to Caldas da Rainha and check-in to your hotel. 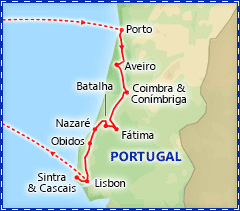 Accommodations: 3 nights PortoBay Marques, Lisbon or similar. Included meals: Breakfast. Full Day Itinerary: After breakfast, board the coach and head for the walled town of Obidos, a medieval village suspended in time. See the castle, churches, and the traditionally painted houses as you walk along the picturesque, cobblestone streets. No visit to Obidos is complete without a taste of Ginjinha, a typical liquor made with sour cherries. Continue along the coast to Torres Vedras and stop for a tour of an architecturally unique winery. You will visit the heart of the winery and see the white and red wine press, the storage and fermentation tanks, and learn how the aromas of the wine combine with the scent of the barrels. Finish the tour with a tasting while taking in the views of the vineyard. Later today, arrive in Lisbon and check-in to your hotel. Full Day Itinerary: Today, enjoy a full day tour of Lisbon, the capital city of Portugal. Start with a visit to the Tile Museum to learn tile painting, an ancient art very popular throughout Portuguese history. Continue to the historical city center for a walking tour and see Rossio Square, Augusta Street, and Terreiro do Paco Square. After lunch on your own, proceed to the Belem district, which houses some of the main attractions of the city. 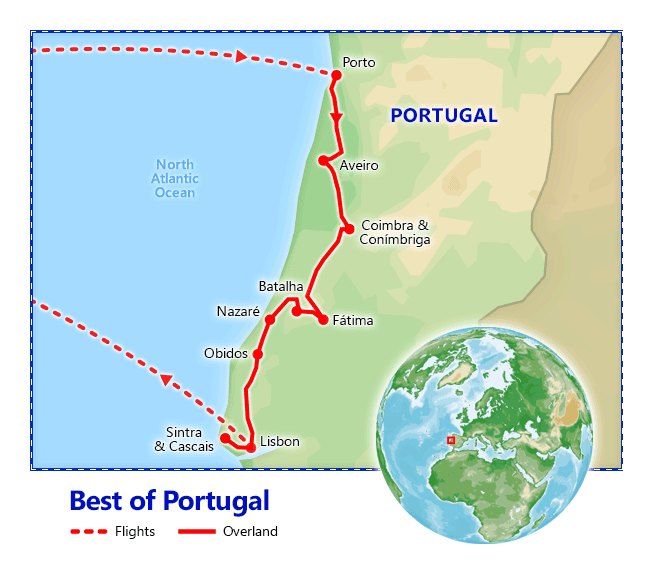 Visit Jeronimos Monastery, Belem Tower, and the Monument to the Discoveries. Along the way, stop for a taste of some traditional Belem pastries. Return to the hotel and enjoy the balance of the day at leisure. Enjoy a Fado show with your fellow travelers during a farewell dinner with wine. Full Day Itinerary: This morning, travel north to Sintra, an amazing and romantic location where several kings of Portugal used to vacation. Visit Pena National Palace, located in the Sintra hills, it is the greatest expression of 19th century romanticism in Portugal. The palace was built in such a way as to be visible from any point in the park, which consists of a forest and luxurious gardens with over five hundred different species of trees. Continue along the coast until reaching Roca Cape, the westernmost point of Europe. From here, proceed to Cascais, a beautiful coast city with 18th and 19th century buildings once belonging to Portuguese nobles and aristocracy. Enjoy a panoramic visit along the coast and the city, stopping in the center for free time. Continue to Estoril and drive by Casino Estoril, the biggest in Europe, and the Hotel Palacio, both locations rumored to be inspirations to Ian Fleming for his first novel, Casino Royal. Return to Lisbon to freshen up before dinner. This evening, share one last experience with your fellow travelers while listening to a traditional Fado show during your farewell dinner at a local restaurant.